Tod Williams Billie Tsien Architects, American Folk Art Museum, 2001, New York. Photo: Dan Nguyen/Flickr. 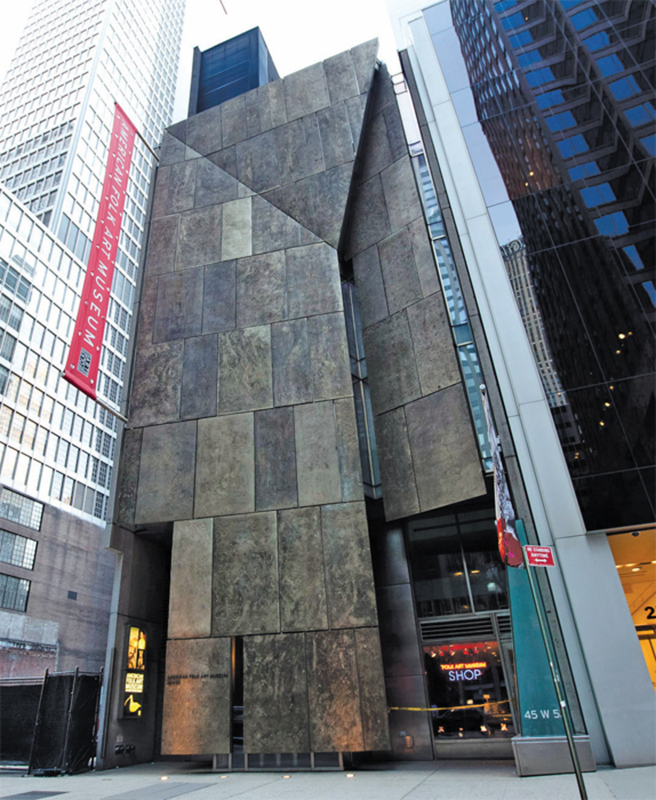 THE MUSEUM OF MODERN ART’S contentious decision to raze the former American Folk Art Museum building, designed by Tod Williams Billie Tsien Architects, has put preservation at the center of an international debate about cultural value and the public’s appreciation of contemporary architecture. The heart of the controversy is a disagreement over whether or not MoMA has a responsibility to preserve the thirteen-year-old building. While the structure is too new to qualify for the protections associated with historical status, and MoMA is therefore under no legal obligation to save it, advocates of the former AFAM argue that its architectural quality transcends temporality and lends the building an inherent cultural significance. Despite their widely divergent views on the appropriate course of action, however, all parties involved seem to agree about one thing: the definition of preservation. The term is invoked as if it has an essential, self-evident, and constant meaning that is the opposite of change, of which demolition is the most extreme case. But preservation today encompasses far more than the simple question of when a building can or should be destroyed. Regardless of the fate of the former AFAM, one of the primary lessons to be drawn from the current polemics is that we need a deeper understanding of both preservation as a practice and its potential role in contemporary culture. Indeed, the field of preservation has never been more broadly relevant, as questions of historical status are ever more prominent in both art and architecture. On the one hand, cities are increasingly defined by rebuilding and reuse; since the tabula rasa is now a thing of the past, architects are forced to confront the inevitable interplay between construction and destruction as an ethical question of sustainability. On the other, contemporary artists have recently turned to a wide range of preservation techniquesreconstruction, replication, reproduction, re-creation, refinishing, and reinstallation, to name only a handfulin search of new modes of expression. In turn, preservation has looked to art to expand the aesthetics of memory, cultural trauma, historicity, and temporality. For example, in 2002, when the Johannesburg Development Agency undertook the complex task of preserving the city’s Constitution Hill Precinct, home to one of the most notorious prison complexes of the apartheid era, they opted against hiring a traditionally trained preservationist. Instead, they selected South African artist Clive van den Berg to create permanent installations throughout the infamous prison buildings, an aesthetic transformation that signaled their shift from active penitentiary to heritage site. The richness of these new interdisciplinary exchanges is missing from the reductive portrayal of preservation in the AFAM debate. To acquire an understanding of any art requires time and curiosity; both are in short supply in the heat of fast-paced public confrontations. What follows, then, is only a brief invitation to look beyond the headlines into this emerging field of practice. To understand why preservation is still so often reduced to a save-or-destroy binary, we must remember that its origins, in the 1960s, lay in a much more clear-cut struggle over the quality of urban life. In that decade, a range of historians, artists, and architects established the field as they rightly fought the kind of rapacious speculation that gave us a dingy underground shopping mall in exchange for McKim, Mead & White’s masterpiece: Pennsylvania Station. Today, urban change is often more enlightened, as we can see in brilliant examples such as New York’s High Line. This adaptive reuse of decaying urban infrastructure, designed by Diller Scofidio + Renfro (also the architects of MoMA’s proposed expansion), with landscape architects James Corner Field Operations, protects the public’s interest in the preservation of industrial heritage and municipal parks while simultaneously increasing private property values. Projects such as the High Line have helped to establish preservation as a dynamic and creative response to existing objects and conditions, rather than a stubborn advocation for the status quo. As the reinvention of the High Line shows, preservation often means profound transformation. In fact, every act of preservation puts the existing object at risk. An extreme example is provided by the Sistine Chapel ceiling, which some experts claim was ruined in its last preservation campaign when conservators allegedly mistook some of Michelangelo’s al secco details for the work of previous restorers and cleaned it away. The risk is usually deemed a necessary one, however, because the alternative is destruction, whether through a deliberate and sudden blow, as in the case of McKim, Mead & White’s Pennsylvania Station, or through a slow surrender to the effects of time, presumably the fate that awaited the High Line but for DS+R’s intervention. Despite its strong association with history, preservation is as much about looking forward as it is about engaging the past. The future of any cultural object is, like that of any individual, terrifyingly uncertain, filled with unidentified threats. Preservation is an attempt to hedge these risks by controlling the passage of a few privileged objects into the future. That is why I define preserved artworks or buildings as transitional cultural objects; they help us to face the unknown and allow us to cope with the anxiety of transitioning into it. The scope of preservation, in other words, is by no means limited to old things. The age that qualifies an object for protection is entirely a cultural choice, one reason that the relatively recent construction of the AFAM building, which has played such a prominent role in the ongoing debate, is essentially irrelevant. In the US, the age criterion varies from federal to state and municipal laws. At the federal level, buildings must generally be older than fifty years to be considered national historic landmarks; but at the municipal level, cities such as New York require only thirty years. In Brazil, new buildings are sometimes legally protected immediately after they are built, as with Oscar Niemeyer’s Church of Saint Francis of Assisi at Pampulha (1942–45), which was designated in 1947. This demonstrates, of course, how cultural values can be enshrined in national laws. But as legal scholar Joseph L. Sax has elegantly argued, the cultural motivations behind preservation extend beyond the grasp of the law: Even if the legal owners of a Rembrandt have every right to, say, riddle it with darts, this might not be an ethical thing to do. Our choice to safeguard an object amounts to an expression of our ability to put our commitment to a collective future above our immediate self-gratification or self-interest. Culture begins with our ability to ask ourselves what objects are worth keeping. But who has the right to select which objects, out of the multitude born into contemporary culture, are to be saved? Preservation is not so much about rights as it is about responsibilities. No single person or institution can unilaterally establish the enduring value of a contemporary object. Museums perfectly illustrate this rule: Their vaults are filled with old art that no self-respecting curator would exhibit today: objects that served as transitional cultural objects only for a brief instant, but that didn’t sustain the public’s interest over time. And because it is so intimately tied to judgments about cultural worth, preservation is constantly evolving, as dynamically as culture itself. In the US, preserving colonial houses was all the rage in the ’20s; now many are in ruins, while the restoration of midcentury modern homes is an obsession from California to Connecticut. This fluidity means that convictions regarding preservation are experienced as personal and subjectiveone reason that the arguments on both sides of the debate about MoMA’s treatment of the former AFAM building have been so heated. Yet preservation is never a single idea or course of action, but rather exists as an elastic force field of ongoing public dialogue. The choice of which objects to admit into our collective image of the future cannot rest on individual fantasies, but must be explored through debate and discourse. As the recent uproar over the AFAM building shows all too clearly, we will never be able to satisfactorily resolve conflicts about preservation until we acknowledge the dialogic nature of preservation itself. Indeed, it is only by attending to the feedback between objects and discourse that the binary of preservation as embalming or destroying can be expanded. Preservation, as a visual art, makes the evolving cultural status of objects apparent. Usually this is achieved through some form of editing: emphasizing certain important parts of the object and downplaying other, less significant aspects. Preservation, in other words, involves questioning the perceived integrity of the object, taking it apart in some way. The mode of creativity that is the mark of preservation, then, cannot be properly judged by traditional criteria such as originality, but instead must be understood as a form of imaginative supplementation. This can be as physically intrusive as adding a binder behind a peeling fresco, or as light as brushing the dust off a sculpture. The simple cleaning of objects, for instance, can express their importance. But even the most self-effacing supplement makes us reconsider the object to which it adds. As with a translator’s introduction to a book, the preservationist’s supplement asks us to judge preservation as secondary and to consider the object as primary, but it is also a reinterpretation of the latter’s meaning. Ideally, the distinction between the object and the supplement, the historical and the constructed, begins to disappear: Is the Parthenon primarily a work of ancient architecture, or of modern preservation? It was hidden inside a thriving Ottoman village before the German Neoclassical architect Leo von Klenze demolished the surrounding houses in the 1830s, and it has been under continuous restoration ever since. It would not exist as a physical building without preservation, and neither would our current understanding of it as a cultural object. Preservation reorients an object’s primary cultural role toward the future, but only tentatively, taking into account the fact that cultural understanding will inevitably change, and that the object may one day need to be supplemented in a different way. Preservation thus asks us to consider what we do to objects, in our efforts to transition into the immediate future, from the perspective of the distant future. Self-consciously temporary, the preservationist’s supplementation turns objects into instruments for looking back at our immediate future from the point of view of that distant futureit is a temporal expression that can best be described as the future anterior. Preservation’s aesthetic work can recast mere things into transitional cultural objects, charged with making tangible something as ephemeral and unpredictable as the future, allowing us to experience it collectively, however briefly, with all the vividness of an enduring reality. Jorge Otero-Pailos is associate professor of historic preservation at Columbia University’s Graduate School of Architecture.